Water, Glycerin, Cocamidopropyl Betaine, Lauryl Glucoside, Potassium Accylates Copolymer, PEG 120 Methyl Glucose Dioleate, Disodium Lauroamphodiacetate, Sodium Cocoyl Sarcosinate, Ethylhexylglycerin, Caprylyl Glycol, Potassium Sorbate, Fragrance. It is extremely gentle and great to use when you're trying new products. It won't help your acne at all, I've had some of my worst breakouts while using this but overall, it shouldn't make it worse. It's great if you're using Retinol A/Tretinoin. I've been using this and Neutrogena oil free moisturizer while on Tretinoin 0.1% for the past 2 months and I've had very little irritation. Not for normal, oliy, or combination skin. 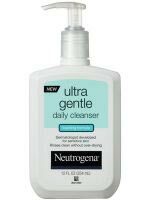 I was looking for a gentle cleanser to use with my current regimen that i'm trying. What the description was saying was so promising and it had fairly good reviews online. When I first used it, i felt like it didnt do any cleansing to my oily/comnination skin. Whenever i used this, i felt like it created a film or left residue on my face. After three days of usages, my face felt like it couldn't breathe. I stopped using it and went back to purpose cleansing bar. Found out, it was leaving a very weird film on my skin. After a day of going back to purpose cleansing bar, i felt what was left behind the film it was creating. I was just full of bumps and white heads that i don't normally break out. Only for people with very sensitive or dry skin. Less irritation than the extra gentle cleanser and the acne.org cleanser. Be warned though that it may contain fragrance but it wont effect your results. I recommend this for combination/oily skin however not for dry skin.